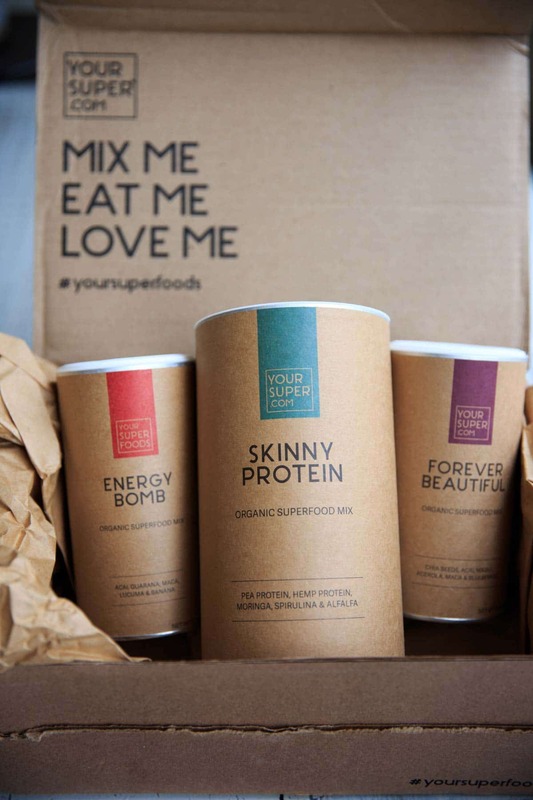 A review of the superfood mixes from YourSuper.com! Skinny Protein, Energy Bomb, Forever Beautiful, Power Matcha, Chocolate Lover, Super Green and Muscle Power were all formulated for a unique health concern. All vegan, plant-based gluten-free, non-GMO, certified organic and only a handful of essential ingredients. Read more about them and get an exclusive discount code here! First things first – for the grammar police, I do not mean to misspell “you are / you’re” Super (even though YOU are!). 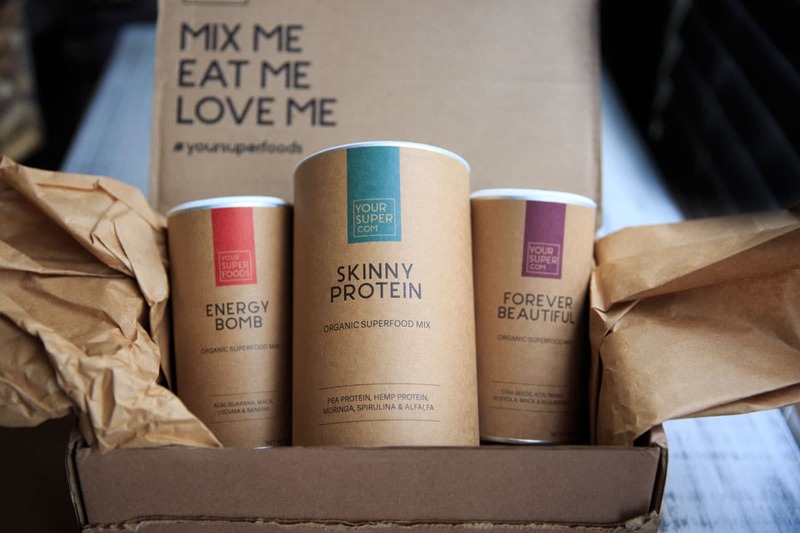 Your Super is short for Your SuperFoods – a company that makes organic superfood mixes! I received a few of their options to try and wanted to share my opinions and a special discount code! Your Super is a company that was started by a young couple in their early 20’s, after Kristel’s boyfriend Michael was diagnosed with cancer. Michael’s recovery included cleaning up his diet to rebuild his immune system, and when they realized that certain superfoods were helping him feel better, they created these superfood mixes to share with the world! Plant based and gluten-free, they were each formulated by holistic nutritionists for a specific health need. Also, every purchase helps support the nonprofit Action Against Hunger, which helps feed children suffering from malnutrition. I have tried 3 of the 7 flavor mixes they offer so far, and I can’t wait to try the others. I will update my favorites as I try more! Forever Beautiful: loaded with beauty berries and omega 3 rich chia seeds, the antioxidants in this blend are meant to promote healthy skin and hair. My favorite mix to add to smoothies. 6 Ingredients: Organic Chia seeds, Organic Acerola Cherries, Organic Acai, Organic Blueberry Powder, Organic Maca and Organic Maqui berries. Energy Bomb: The name says it all – some people love to use this before a workout or as a coffee replacement in the morning! Skinny Protein: A mix of two vegan proteins ( 62% highly absorbable) with 3 green superfoods, and only 1.4g/ carbs/serving. Power Matcha: Formulated for focus, brain power and productivity. Each serving equals one serving of greens and the caffeine of one cup of coffee! Chocolate Lover: High in magnesium and zinc, great for a mood boost. Definitely next up on my to-try list! Super Green: Easy way to get your daily portion of greens and build your immunity. Muscle Power: Similar to the Skinny Protein above with the two vegan proteins (with rice protein instead of hemp protein) and 3 energizing superfoods instead of greens. 60% protein. They offer a couple “bundle” box options: a Detox bundle, which includes 3 of the mixes plus a detox guide. and an Ultimate Health Bundle, which includes all 7 of the above mixes. They also have travel packets, which are perfect for when you’re on the road! Considering how much I’ve been traveling this year, they really are useful. They say you can add them to any drink, including straight water – but as much as I love these mixes, I would not recommend them with plain water (except maybe the Forever Beautiful, which is mostly berries)! They are great for adding superpowers to your smoothies, and the flavors blend in much better. I don’t think these were made to taste super delicious on their own, but instead to be used as more of a boost to existing foods or drinks. The exception would be the Matcha – that would be great with milk + a little sweetener! Some of the mixes you can even sprinkle over food! Start small to make sure you don’t over-do it, and the ones I would suggest for food are: skinny protein or muscle power in something savory like hummus or protein pancakes and chocolate lover for desserts! I love that they all have only the necessary ingredients and are certified organic, non-GMO, plant-based and gluten-free, free of additivies and preservatives, 100% natural. Their ingredients are all sourced from small suppliers or directly from farmers and are lab-tested to ensure the highest quality. These all make me feel super healthy and helps me feel better knowing that I’m doing something good for my body. The packaging is also sustainable and from recycled materials!